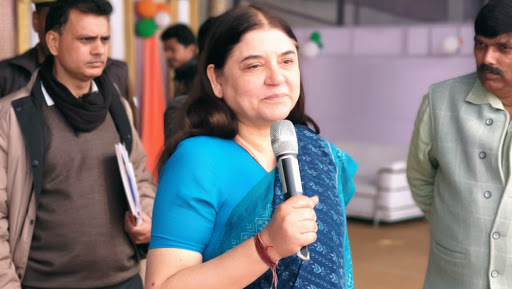 New Delhi, April 12: The Election Commission on Friday issued a show-cause notice to the Union Minister and Bharatiya Janata Party candidate from Sultanpur Maneka Gandhi for her alleged remarks in which said that she won't work for the Muslims in Uttar Pradesh's Sultanpur if they don't vote for her in the upcoming Lok Sabha Elections 2019. Reacting to the show cause notice issued by the Election Commission, Maneka Gandhi said that she had called for a meeting of BJP's minority cell and accused of her statements being taken in the wrong context. She said, "I had called a meeting of our minority cell...If you read my complete speech, channel is running that one sentence out of context and incomplete." Earlier in Sultanpur rally, she had said, "I am winning. I am winning because of the love and support of people. But if my victory is without Muslims, I won't feel that good. Then when a Muslim comes to me for work, I think let it be, how does it matter. It's all give and take, isn't it?"